Though it is often seen as a quick stopover on the way to seeing the rest of Brazil and South America, there are so many reasons to put the gargantuan metropolis of São Paulo on your backpacking itinerary. With a wealth of different cultures coexisting and some incredible nightlife, it’s not a stretch to regard SP as one of the most fun cities on the continent. For travelers on a budget, here are some of the best backpackers’ hostels in Brazil’s biggest city. In the heart of Vila Madalena is Ô de Casa, proud to be the first independent hostel in São Paulo when it opened in 2007. The bohemian neighborhood of Vila Madalena is highly sought after for backpackers visiting São Paulo, with its artsy vibes, graffitied walls, great restaurants and countless cool bars. It makes Ô de Casa an excellent option for all travelers looking to experience this popular part of the city. The colorful house fits in perfectly with the vibrant neighborhood that surrounds it, and the entire atmosphere of the hostel feels like one big shared house, sleeping up to 80 guests in dormitories and private rooms. There’s plenty to do in Ô de Casa’s common areas, with a home theater system, a foosball table, books, a jukebox and even a terrace with an impressive movie projector. There’s plenty of opportunities to socialize with other travelers, either in the aforementioned common spaces or in the hostel bar, which is open to the public all week (guests get a discount). Rates begin at R$ 50/night ($15) for dormitories and R$ 130/night ($39) for private rooms. Bee.W is another hostel that stands out for its superb location. On Rua Haddock Lobo, two blocks from Paulista Avenue, only one block from famous nightlife spot Rua Augusta and with two key subway stations very close by, Bee.W is right in the middle of it all. However, as well as being a stone’s throw away from the action, the tree-lined street of Haddock Lobo is actually quite chill, giving you the best of both worlds during any stay at Bee.W. The hostel’s six rooms (four co-ed dorms, one female-only dorm and one private) all have their own unique design as well as all the facilities you’ll need for your stay. The common areas are impressive, with a gorgeous terrace that is excellent for socializing and even a spot of sunbathing. The hostel bar, Bee.W bar, is already well known around the region and attracts a young, hip crowd every weekend. Rates at Bee.W begin at R$ 50/night ($15) for dormitories and R$ 245 ($73) for their private room, which sleeps up to three guests. Created by two friends who traveled the world, staying in their fair share of hostels along the way, Café Hostel is the quintessential backpacker’s choice for a place to stay in São Paulo. With a keen sense of everything a good hostel needs – a great location, clean, comfortable and well-equipped rooms, helpful staff and a fun atmosphere – Café Hostel is practical, welcoming and a great place to meet new people on your journey. Located less than two minutes away from the subway, Café Hostel is in a particularly chilled and beautiful part of Vila Madalena. The hubbub of the neighborhood’s hip bars and restaurants are only a short downhill stroll away, while the hostel itself is right around the corner from Mercearia São Pedro, one of the city’s most charming bars. The staff are extremely friendly and attentive, while the hostel even has its own YouTube channel if you’d like to get to know the team even better, as well as picking up some great tips for your visit to São Paulo. Rates start from just R$ 35 ($10) and from R$ 150 ($45) for private rooms. Just a couple of blocks away from Ibirapuera Park, São Paulo’s vast and stunning urban park, is WE Hostel. Housed in a wonderfully preserved 1920s mansion, it is a hostel that looks a lot more like a hip design hotel, except you’re only paying half the price. In the charming and quiet neighborhood of Vila Mariana (the Ana Rosa subway station is a less than 15-minute walk away), it’s a great place for those looking to chill out in the city and meet a whole bunch of fellow travelers. With a total of seven rooms – including co-ed dorms, an all-female dorm, a private single room and a private double room – excellent common areas and a lovely garden, it’s a solid option for any backpacker visiting SP. Rates start from R$ 55 ($16) for dorms and R$ 150 ($45) for private rooms. Did’s Hostel, just off Paulista Avenue in the neighborhood of Jardim Paulista, boasts that they seek to treat each one of their guests like old friends, offering plenty of advice and suggestions for tourists in a welcoming and laid-back setting. Location-wise, Did’s is ideal. A few blocks from Paulista Avenue, it is within easy walking distance from subway stations and the São Paulo Museum of Art (MASP), while there are lots of buses to all over the city on the nearby avenues of Nove de Julho and Brigadeiro Luis Antonio. The hostel has four rooms, one of them a private double room, and rates start from R$ 45 ($14) for the 12-bed dorm and R$ 150 ($45) for the private double room. 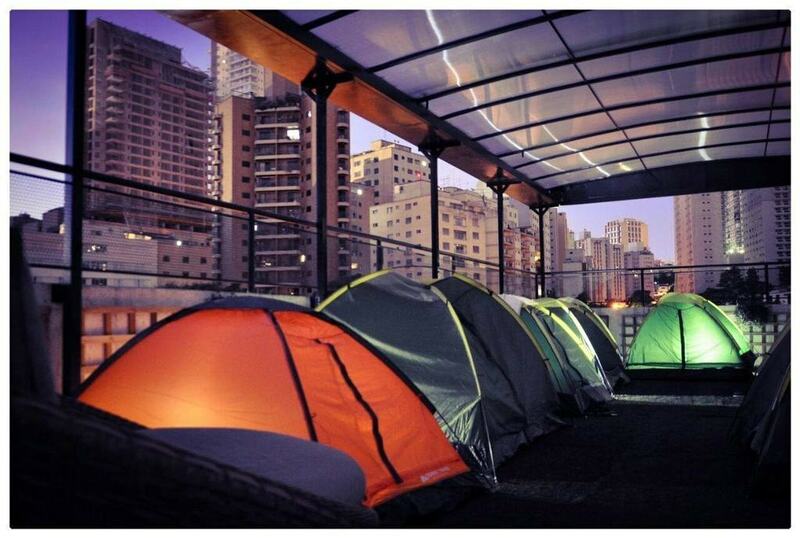 Have you ever thought about camping on a rooftop in the middle of one of the world’s biggest cities? No, us neither. But as it turns out, it’s a pretty unique experience and at Aki Hostel you can try your hand at a spot of urban camping, checking out São Paulo from a completely different angle. If that’s not your thing, Aki Hostel also has over 20 normal rooms, shared and private, housing a total of 86 guests at any one time.